The event, ASASSN16-oh, was first noticed as a transient in the Small Magellanic Cloud by the All-Sky Automated Survey. Additional observations from NASA's Swift Observatory and the Chandra X-ray Observatory helped to verify the finding. "In the past, the supersoft sources have all been associated with nuclear fusion on the surface of white dwarfs," said lead author Tom Maccarone, a professor in the Texas Tech Department of Physics & Astronomy. "As a white dwarf captures material from a companion star, the material piles up on the surface and becomes hot, and, eventually nuclear fusion takes place, much like in a hydrogen bomb. "But this emission is coming from a region smaller than the surface of the white dwarf, and we have strong arguments against any kind of explosion having taken place on the white dwarf. Specifically, there are no broad emission lines in the X-ray or optical spectra, so there cannot have been any kind of strong wind generated. In some cases, nuclear fusion can be steady on the surface of a white dwarf, but it cannot start immediately as steady fusion. There must be an explosion of some kind when the fusion starts." "What we're seeing here is a transient episode of supersoft emission, but without any of the signs that we associate with nuclear fusion," Maccarone said. 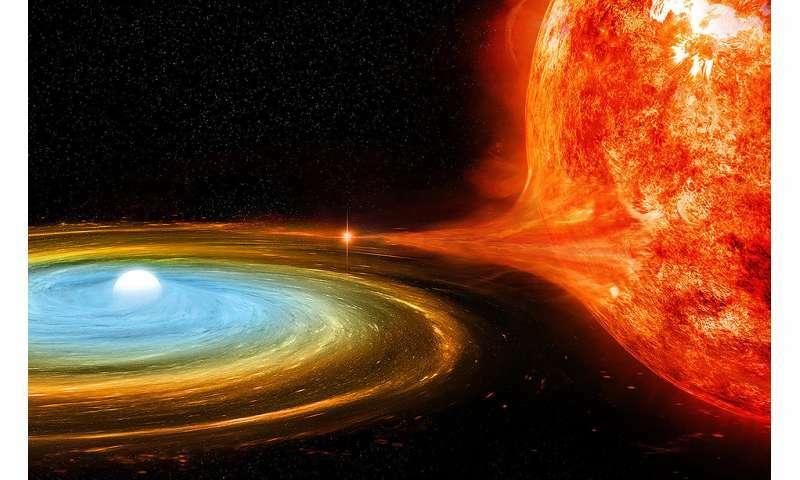 "If a nova took place, we would expect to see material flowing away from the white dwarf. Here we don't. Instead, what we are seeing is hot emission from the disk that is transporting the material from the companion star to the white dwarf. The transfer of mass is happening at a higher rate than in any system we've caught in the past." "I am excited by this result," Maccarone said. "It was a totally new phenomenon, and any time one finds one of those, it's exciting." "These systems also are the way we measure the expansion of the universe," Maccarone said. "To measure that expansion more accurately than we do now, we need to understand the origin of the Type Ia supernovae. This finding – that there's a new way to make supersoft sources – will cause us to re-think our approach to matching up the populations of these objects with the rates of the supernovae." The biggest mistake of GR/QM based cosmology has been the math model of observed power density, distance and angular measures of SN1a data. Tolman derivation of the extra 1/(1+z) effect of redshift on the observed power density includes the 'Planck energy dilution'. Another mistaken factor 1/(1+z) comes from using the coordinate distance to emitted object vs. dynamic universe based optical distance D. This makes FLRW prediction of observed power density lower by factor of 1/(1+z)^2 than the DU prediction without any 'epicycle' parameters of DE/DM that would imply accelerated vs. correct decelerating expansion speed C4=C of Riemann 4-radius R4. See DU book sections 1.2.5 or annual papers and PFS seminars to explain SN1a data without DE. Well, SN1a modeling with DE interpretation is just ONE mistaken APPLICATION of 5-10 corollaries of the main GR/QM mistake in physics foundations about the constancy postulate of C in spacetime, disconnected from the variable expansion speed C4 of 'bouncing' Riemann 4-sphere radius R4 (Mother of all strings). The DU math explanation for APPARENT vs TRUE constancy of C is related to the profound problem of epicycle vs physical math model, not removed by GR/QM theories some 100 years ago resulting in the well-known problems or 'crisis' in cosmology & physics foundations and in countless arguments/debates. They have prevented getting be heard by the problem solvers such as DU or related surveying math community of general estimation and inverse theory. The resulting dead-lock of 'getting heard vs. pushed-over' in physics community repeated the history of Galileo, Copernicus and Kepler times by e.g. confusing Nobel committees to declare DE or GW 'confirmed' on false reasoning. In other words, the systematic error of FLRW prediction in observed SN1a power density is compensated or absorbed by the auxiliary DE/DM term parameters of the mistaken cosmological constant and its mistaken interpretation of accelerated expansion with some 70-90% 'missing' dark energy/matter - nowhere to be found despite the already wasted efforts prompting plans for future, similarly wasted, space programs to find solutions to problems already spelled out in DU literature (including DM) since 1995. As an outsider to 'traditional' physics community (other than physical geodesy, GPS and satellite image/geoid mapping technologies) I have made my part in attempting to digest GR/QM and DU physics foundations during my retirement. See related comments of WSU Master Classes, Nature and PO debates since fall 2014. Now is time to say goodbye and wish you Happy Holidays and better New Year in understanding DU physics foundations. Kippis! I recommend PO posters to read some common sense explanations of some mistaken GRT/QM postulates (relativity, equivalence principle, DE epicycle etc.) in terms of global DU unified theory, see literature collected at http://www.lfs.fi/ supporting my repeated but cryptic (1K byte vs some 10p long) comments. See eg 2018_Talvio2.pdf.